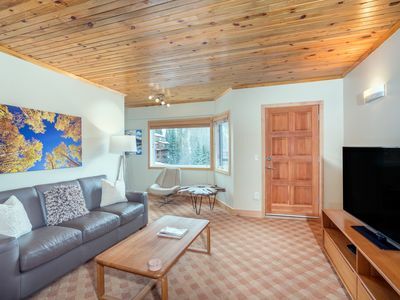 We welcome guests to our 2 BR/2 Bath SKI-IN/SKI-OUT condo nestled in downtown Telluride at the base of Milk Run/Stumper ski run adjacent to Coonskin Lift #7. 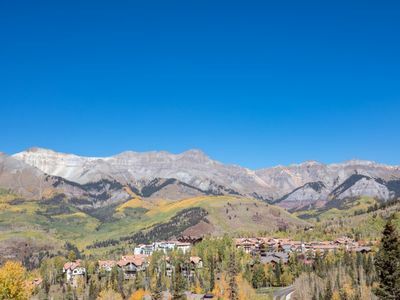 You can look forward to spectacular mountain views as well as perfect location for everything Telluride has to offer-skiing, biking, hiking, fishing, FESTIVALS and more. Oh and enjoy the shared hot tub (year-round) and pool (summer)! 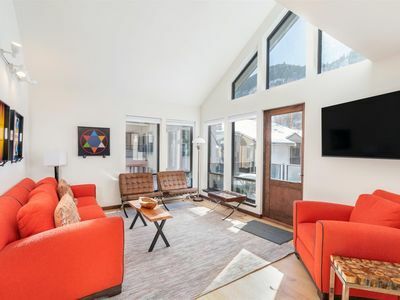 Beautiful views and great downtown location make this a home run for anyone looking to explore Telluride. 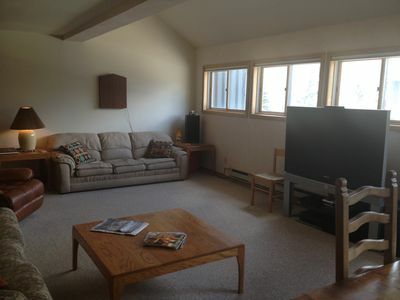 Our home offers all the comfort of a mountain lodge and the convenience of ski-in/ski-out access in winter. 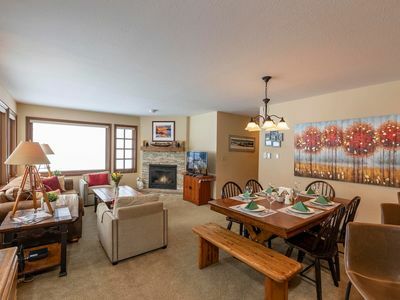 Upon entering our second floor condo, you will be greeted by granite countertops, an intimate fireplace, and truly breathtaking views of the surrounding mountains. You can look forward to sharing a meal at our dining table and a morning coffee in our comfy chairs as the sun rises above Ajax peak. 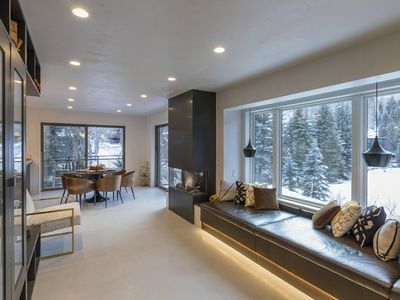 After a long day of skiing, hiking or mountain biking, take in the surrounding mountain range view without ever leaving the glow of the TV (Spectrum Cable) or the warmth of the fireplace. Our fully stocked kitchen makes it easy to prepare everything from a quick breakfast to a large feast. We'll provide a limited amount of coffee to get you started. When you're finally ready for bed, you can find comfort in the master bedroom and a queen bed you won't want to leave. The en-suite bathroom is finished with custom marble tiles and granite countertops. We offer high-end, large towels in the bathroom, along with two comfy robes for lounging in the condo or heading to the pool. The master has a flat screen TV with Roku connected to the main living room TV via the Spectrum cable app. Our second bedroom has a twin bed over a full bed, plus a pullout twin trundle, making it great for families with children. The guest bedroom has a flat screen TV with Roku connected to the main living room TV via Spectrum cable app. If you feel the urge to cool off in the summer or maybe warm your bones in the winter, you can visit our complex's pool and hot tub facilities. They are shared with the other tenants in the complex so please be kind and courteous. The hot tub is open year-round and the pool is seasonal - summer only. For those that need to mix a little work with pleasure, we have a WiFi enabled Epson work force printer/scanner/copier. There is extra paper and print cartridges in the condo. Please let us know, if these items are running low. Guests will have access to our entire private condo, as well as access to the shared hot tub (year-round) and pool (seasonal) complex. In winter we also have a ski locker located inside Telluride Sports at the base of Coonskin Lift #7. 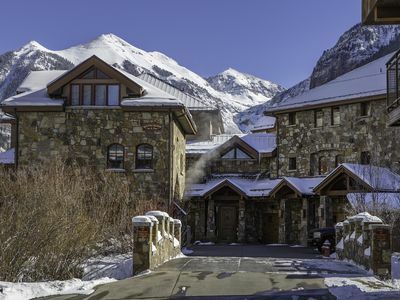 Telluride Sports is great place for ski rentals as well as a ski and board tuning. 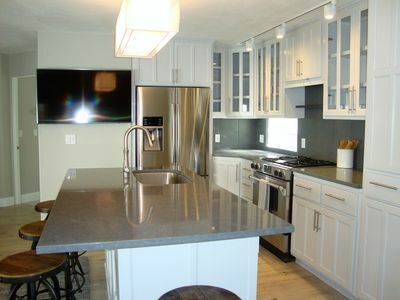 Lastly, there is a washer and dryer in unit for your use! Our home has self check-in so guests can come and go as they please, but we are always nearby to answer questions or address any issues. 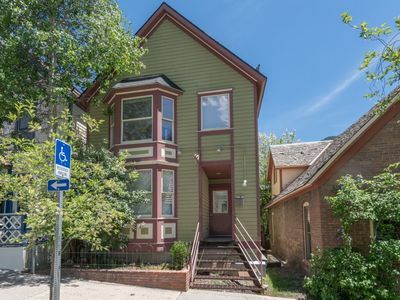 Walk to Clark's grocery store a few blocks away, or stroll through historic Downtown Telluride. The free in-town Galloping Goose Shuttle runs every 7-8 minutes and stops at the condo - simply wave the driver down. Hiking, mountain biking, skiing, snowboarding, museums and art walks are all close by. 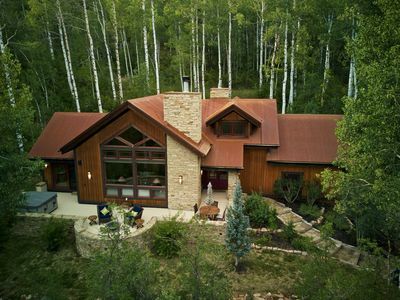 This is an ideal location for taking in all the festivals Telluride has to offer - Bluegrass, Plein Air, Ride, Film Festival, Blues and Brews and many more. 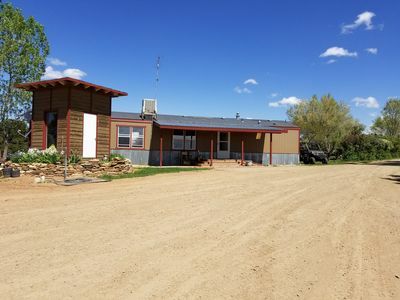 The condo is nestled between the San Miguel River and the ski mountain. We sit at the edge of downtown and adjacent to the ski mountain so we enjoy all downtown has to offer but in a quiet setting. 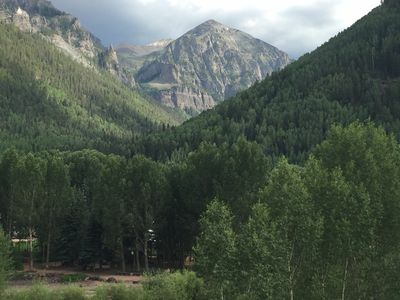 Walk to Clark's grocery store a few blocks away, or stroll through historic Downtown Telluride. The free in-town Galloping Goose Shuttle runs every 7-8 minutes and stops at the condo - simply wave the driver down. 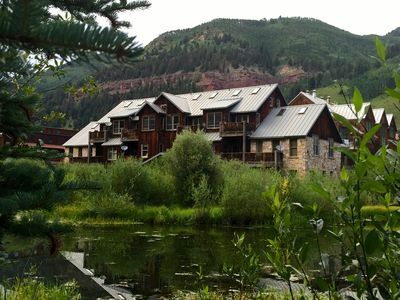 Hiking, mountain biking, skiing, snowboarding, museums and art walks are all close by. 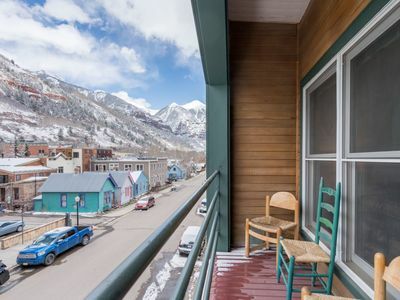 This is an ideal location for taking in all the festivals Telluride has to offer - Bluegrass, Plein Air, Ride, Film Festival, Blues and Brews and many more. 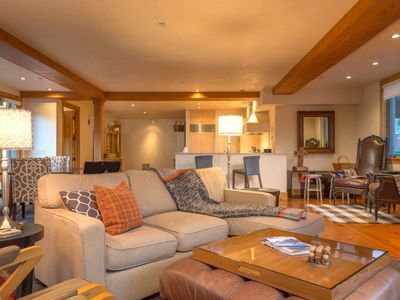 The condo is nestled between the San Miguel River and the ski mountain. 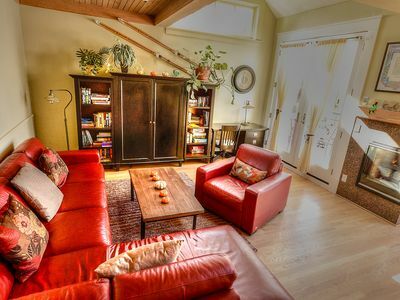 We sit at the edge of downtown and adjacent to the ski mountain so we enjoy all downtown has to offer, but in a quiet setting. 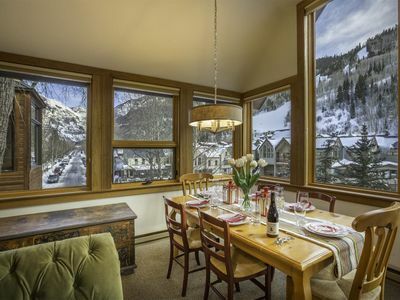 Since our condo is ski-in/ski-out, access to the slopes and Telluride is a breeze. Catch the lift just about 150 feet away from our place! We have a ski locker at Telluride Sports for convenient ski storage at the base of the Coonskin Lift #7. 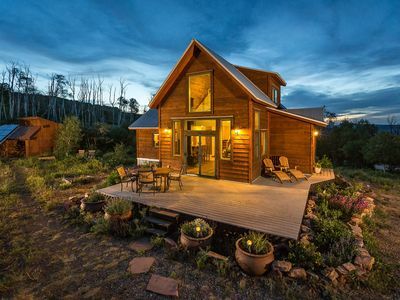 We are nestled between the San Miguel River and the ski mountain - so you have easy access to the bike/hiking trail along the San Miguel River. There is no parking available on-site, but you will receive a parking pass for the lot across the street - Shendoka lot. With the parking pass you can park overnight in the lot. The lot is free for daily parking. Please observe all parking signs and notices at the entrance to the Shendoka lot as portions of the lot are closed off temporarily (one day at a time) in winter for snow removal - mostly on Friday's. In addition, just north of the Shendoka lot on the other side of the San Miguel River is a free lot with 72 hour overnight parking. The free in-town Galloping Goose Shuttle runs every 7-8 minutes and stops at the condo - simply wave the driver down. Uber is in town for any other town travel needs! Parking is located across the street in a public lot. We will provide up to 2 overnight passes for you, but please note that this is a first come first serve lot and that spots are not reserved! Endless Summer In Telluride! 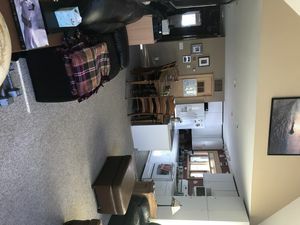 Large Riverfront Condo, Private Home Feel. 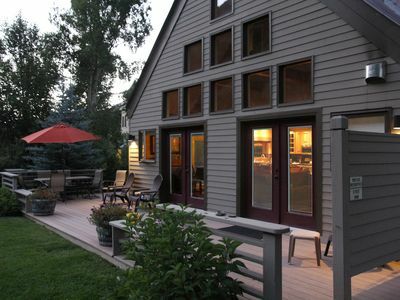 900sf Deck. Pool, Hot Tub. 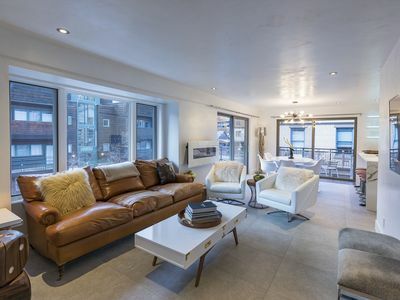 4 bedroom, 4 bath luxury condo with a great all-season location, spacious rooms and great amenities. Ice House Suite 200 Amazing location. Bright, Cheery, and Thoughtfully Appointed with a Touch of Whimsy. Conveniently Located!